Giri is an ancient Sanskrit word which literally means rock or something coming from the mountains. Giri also refers to rising ground or mountain. Giri is found to be referred in Panini (पाणिनि), Arthav Veda and Riga Veda where this word denotes a mountain, elevation, hill, rock, rising ground and a mountain having many parts. Reference of Giri is also founded in Shrutbodh (श्रुतबोध) in which Giri denotes the number 8. This name is also referenced in Naighantuk (नैघण्टुक), Nirukt (निरुक्त) and Sayan (सायण) where it denotes cloud. Mention of Giri is also found in Unadi-Sutra where it refers to a particular disease of the eyes. Lexicographers like Amar Singh, Hemchandra and Halayudh have used Giri in their litterateurs with meanings like venerable or a particular defect in mercury. According to the graph shown here Giri is not a popular name in the USA. 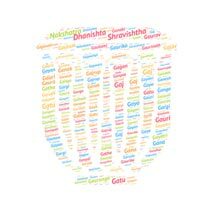 Giri is a very popular name in India. Giri is short, sweet and easy to pronounce name. Giri Babu, is a South Indian actor. V. V. Giri, was the fourth President of the Republic of India from 24 August 1969 to 24 August 1974. Giri, is a 2004 Indian Tamil action comedy film. Derived from the Sanskrit jayanta means 'victorious'. Indra'..